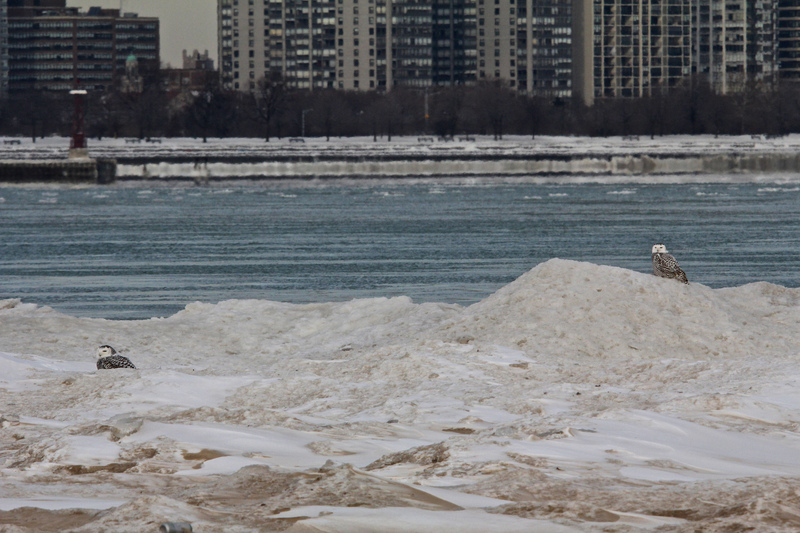 Up to my hips in snowdrifts, I braved the Chicago wind chill at the 31st Street Marina when the last snowy owl invasion happened years ago. 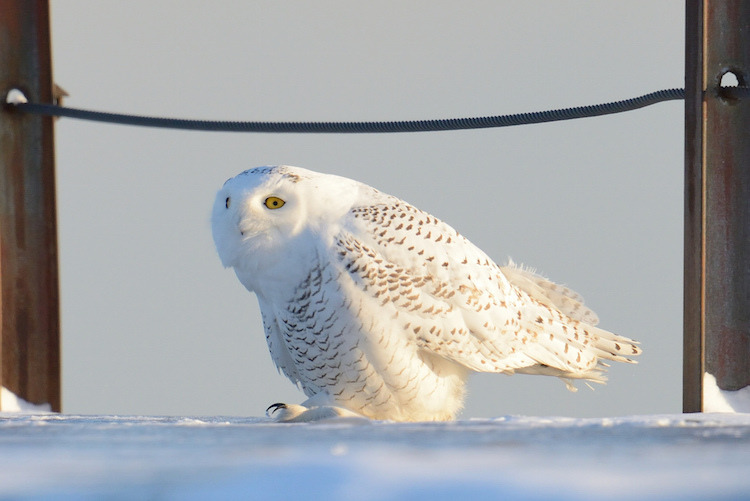 A warm Arctic summer means more lemmings, which means more food for owls, which means more eggs in the snowy owls’ nests, which means, when the weather turns back to winter, an out-migration of owls down to the Great Lakes. I searched for these visiting owls at every opportunity. I had heard they like the jetties, they are solitary, and they hunt coots, so I’d look for coots (with a hint of shame that in so doing I was wishing for a coot to fall victim to the sudden swoop of talons by the true object of my desire). Now that I’m in the know about birding sites, Facebook pages, and the social media outlets of the bird-obsessed, I’ve noticed that there is a reluctance to be too specific about location when it comes to owls. 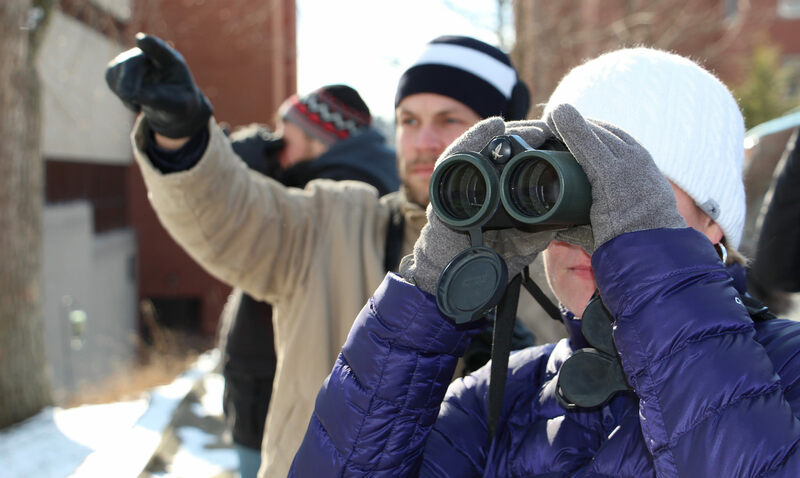 Birders who will name the very bush at Montrose Point Bird Sanctuary in which they found a Blackburnian Warbler suddenly speak in the most general of terms when it comes to owls. “North side” the caption of the photo would say, and I’d be reduced to looking at the background objects, in case I could identify a more specific venue and go there. And then, this winter, on one frustrating Sunday when I’d already been sick for a week with the flu, I felt just well enough to pull on my parka and stumble outside. In the back of my mind, I think I believed a week of fevers entitled me to see an owl if I dragged myself out to look. And guess what? I saw one. Walking along the length of the 31st Street Marina, when I neared the docks I trained the binoculars on the far rock wall of the breakwater, seeing, at first, nothing but rocks. And then, over the top of an ice machine (a remnant of warmer days) a pure-white hole in the darkness of the rocks, the arc and movement of a wing. “I’m looking at a snowy owl!” I exclaimed to my husband, who came along because I was sick, more than out of any great love for owls. The moment of finding that which has been long sought brings an intense and radiating joy. My husband doesn’t talk much, but I knew he felt it too when I saw him take his turn with the glasses. I leaned back against the walkway’s retaining wall to steady myself, ignoring the cold of the concrete and the remnants of my chills and fever, settling in for a long look. A young man came loping along the top of the wall I was leaning against. He asked if we’d seen the owl. “I’m looking at one right now,” I told him, and gave him specific landmarks to point his glasses in the right direction. There were two, as it happened, and he oriented us precisely to the other one. Maybe owls had been at this location in prior years and I didn’t know how to look for them. Without good magnification, they look like ice on the rocks—little bumps of white sticking up from the breakwater wall—or a trick of the light. They can hold their bodies still for hours, barely moving except to swivel their heads back and forth, looking, presumably, for the unfortunate coots. It was the swivel that caught my attention on my next expedition, when I saw a female at the far end of the rock wall, facing the lake, winter winds lifting the soft feathers of her striped breast. In the weeks that followed, my vision was trained and further refined by the kindness of strangers. All winter whenever I went to the marina to look, others were there, and many of them were more seasoned searchers. On my last visit, though, I encountered a couple who, like me, had sought for years without finding. Emboldened by my winter of owls, I now understood how to look and so I took in the slow panorama of the long breakwater. One was out there. I ran down the walkway to my fellow seekers and asked the woman with the telephoto if she’d seen it. Then, because she hadn’t, I directed her toward the exact location. I can remember another time, at Montrose, when I went in search of long-eared owls I’d heard were there. Some kind soul left a purple hair band hanging on a tree as a pointer, but I’d never have seen them if another birder hadn’t patiently guided my eye exactly to them as I followed his instructions. (Half-way back. 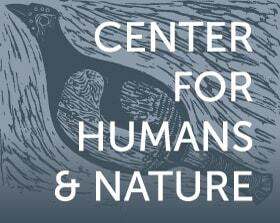 See that branch at a 45-degree angle? Look 2/3 along it and then look up.) My happy gasp indicated that I’d found them. Owls are big birds. 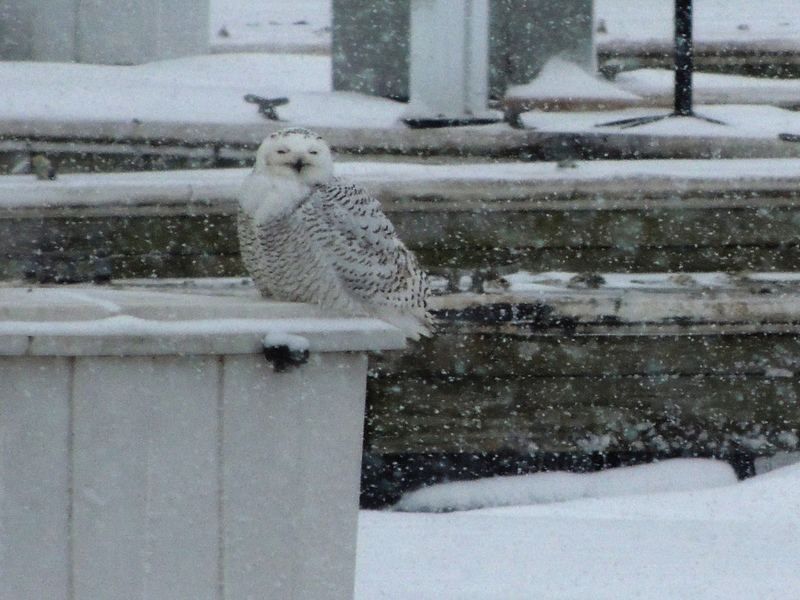 Snowy owls can be two or two-and-a-half feet tall, with wingspans up to five feet. Such bodies take a lot of energy to support when temperatures are low and food is scarce. They fly a long way to get here and are tired after the journey. And though they come to live among us for a time, all along the lakeshore, they are profoundly wild things. Too much human activity near them and they will give up their search for food to look for another resting place, expending much-needed energy in the flight. And so the caginess of those who post photos on the Internet—“North Side,” “McHenry County,” “South Chicago.” No one wants to be the one who set off a stampede of eager humans to harass a beautiful visitor to exhaustion or starvation. But when I am on-site at the places where owls are present, I have found that there is an extraordinary happiness among us seekers in pointing each other’s eyes in the right direction. There is pleasure in witnessing someone like ourselves, though a stranger, find the thing they have come looking for. It becomes a shared wonder to hear that little aspiration of amazed joy at someone finding the eye-piece full of the white and black breast of a female, and getting a close enough look to see her head swivel first one way and then the other in that owlish 180-degree rotation. It strikes me that this is inherently a city creatures experience. In the density of our urban landscapes, we often encounter not only our wild visitors but each other. Snowy owls come like avatars from another world, bearing another way of being into our midst, and though we demur from saying too specifically where we found them, amongst ourselves we like nothing better than to watch the face of another human as she sees what we have seen. Clare Butterfield is the Executive Director of the Christopher Family Foundation. She is the former Program Director at the Illinois Science and Energy Innovation Foundation, the former Director of Faith in Place, and an ordained Unitarian Universalist community minister.